An 18k Rose Gold Tankissime Ladies Wristwatch, silver dial with roman numerals and a secret signature at "X", blued steel sword shaped hands, a fixed 18k rose gold bezel set with approximately 22 round brilliant cut diamonds, an 18k rose gold crown set with a single round brilliant cut diamond, an 18k rose gold bracelet set with approximately 114 round brilliant cut diamonds, a concealed 18k rose gold double deployant clasp, sapphire glass, quartz movement, in excellent condition, comes with a Cartier box, our own certificate of authenticity and our own one year warranty. N.B. 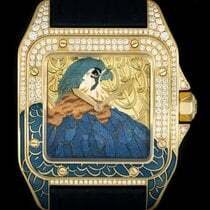 This watch has a total diamond count of approximately 137 round brilliant cut diamonds (~3.78ct).